A whirlwind adventure with a happy ending. The author is on a quest to visit every country in the world. Eric—co-owner of the Perroquet Hotel in Port Au Prince, Haiti whom I befriended on a recent trip—was drinking a Prestige stubby and packing back and forth, noticeably upset about his missing dog. “It’s just a mutt, but it’s the friendliest dog you’ve ever seen,” he said. In fact, Panda was the hotel’s unofficial mascot. There had been a little shindig the night before, and the dog had been wagging his tail and jumping on everyone’s lap until he suddenly went missing. Maybe the door had been left open and he’d ended up in a stranger’s arms; maybe he’d been dognapped. Either way, he was gone and Eric was not happy about it. 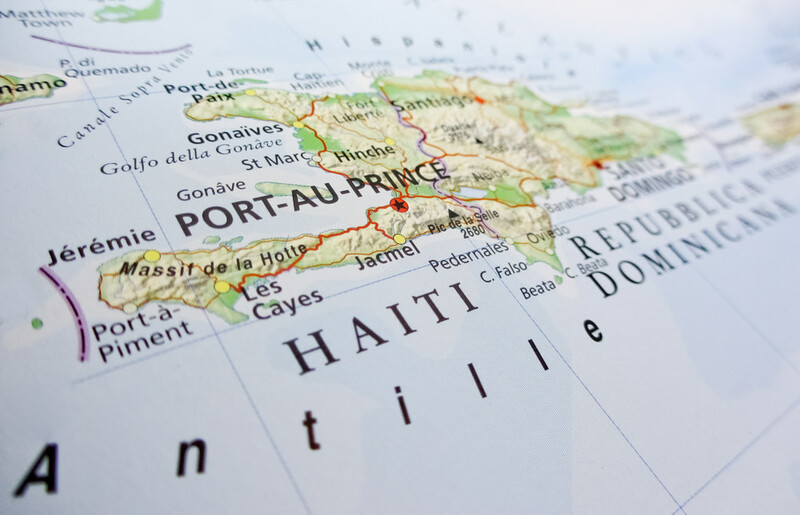 Port Au Prince is a big, crowded city where somehow everyone is connected. Eric knew it was only a matter of time before someone talked. There were a couple of informer types, the Haitian equivalents to Huggy Bear on Starsky and Hutch, lurking around the bar and having their people call their people so the dog could be located. A man named Jackson arrived at the bar and started speaking to the owner in a fast paced Creole. It turns out that the dog had been located and was being held for ransom. The new owners were demanding 10,000 gourdes, or $200 USD, before the dog could be returned. I’d seen enough police movies to know how it would work. The guy with the dog would call and let Eric hear the animal bark or send you a bloody paw wrapped in plastic. Okay, that didn’t happen, but there was a designated drop off zone. I was invited to come along to help negotiate, and it was impossible to refuse. A dog’s life might be hanging in the balance. Each member or our party was each relegated to a different motorcycle taxi, and within seconds we were racing down backstreets to meet up with the dognappers. When we arrived at the spot, there were a handful of men standing outside a dirty mini-market. Haitians in general seem very friendly to me, but these guys looked like they were itching to do something mean to someone. I pulled out my phone to film myself narrating the story and one of them started shouting at me, thinking mistakenly that I was filming him. I set him straight but I could see them sizing me up, looking to see what I might have in my pockets or maybe if I was able to handle myself should something go down. There was a whole lot of talking, but no dog in sight. We got back on motorcycles and started heading back toward the hotel and suddenly stopped in the market area for no apparent reason. A Haitian market is like no other in the world. There are thousands of people selling and buying mangos, shoes, shirts and, as it turns out on this particular day, one dog. There he was, wagging his tail, oblivious to the intentions of his captors. It was Panda, the dog who bore not even the slightest resemblance to a panda. As a self-proclaimed journalist, I did what any other journalist would do: I started filming. The dog was sitting on a little table and being roughly handled. There were piles of trash heaped next to the curb with flies buzzing around and typhoid in the air. Suddenly the dognapper saw me filming Panda, and he went ballistic. I had only captured a few seconds of the dog and the captor wasn’t even in the shot, but you might have thought I had just found a murder weapon with his fingerprints. He was more than agitated and speaking loudly to my motorcycle taxi driver. The situation seemed to be escalating quickly. I didn’t want to be responsible for a dog-icide or my own death, so I started slowly inching my way, out of the hub of the drama. He was speaking Creole, and I understood that he was talking about my video. Then I noticed he was holding a knife. He looked like he was trying to hide it, which made it doubly scary. Suddenly, one of his minions came over to me and said that he wanted me to come over. I imagined several scenarios, none of them pleasant for me. In addition to mangoes and shoes, it turns out, one can buy all kinds of random hardware at these crowded markets. I noticed a big, slightly rusted machete for sale at the kiosk next to me. For less than $2, it turns out that you can become a badass in Haiti. I went from vulnerable tourist to Buford Pusser in 30 seconds. Why did I buy a machete? I suppose it’s the same reason that kids like to carry around swords. It protects them from monsters under the bed and imaginary pirates. However, there are real pirates in Haiti and even though I had no intention of threatening anyone, I felt like that there was less of a chance that anyone would mess with a sea urchin over a starfish. I now had spikes. The men had thought that they were dealing with a typical tourist that would be intimidated by a show of force. They were partially right. I was nervous. What they didn’t expect is that this same tourist would not say a word, but calmly walk over to the weapon center and buy the biggest knife in the market. I could see them out of the corner of my eye. It became clear that they were not going to chase after me and risk having a hand chopped off for a video clip. We walked through the crowd like Moses parting the Red Sea. What exactly happened after my machete purchase is a little bit of a mystery. As we approached the hotel we saw Panda arriving with one of the motorcycle drivers. Somehow, the hostage situation had magically disappeared. Panda was happy no matter who was holding him, but seemed especially joyous when reunited with his rightful owners. Had the captors had a change of heart? Did they think a crazy man was going to kill their family with a machete? I suppose we’ll never know the answer to any of these questions. The important thing: Panda was safe.